Exterior Source Storm Door Installation: We help you get the best fit and more! There’s no avoiding storms, but that doesn’t mean that you can’t do something about them. We understand how the elements can give your home a beating, so we’re here to help you by introducing ProVia storm doors. Exterior Source has been addressing door needs in Richmond, VA and the Tidewater areas since 1993. As a ProVia dealer, we’re proud to offer our clients the best in storm door options, allowing them to reap the benefits of using a product from one of the most trusted names in the remodeling industry. Want extra protection from bad weather? 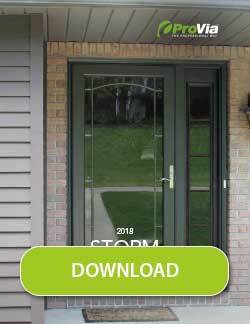 An energy-efficient storm door from ProVia is the answer! Depending on what your needs are, you can get a storm door with either a full pane of glass, or one with just half glass. ProVia storm doors come in 50+ models with numerous glass options. Each storm door can also be customized further with accessories, fitted with tempered safety glass and a durable finish to last. Looking to save on energy costs? ProVia storm doors are built to be energy-efficient by creating an insulating layer between your home and the outdoors. With drafts minimized and indoor temperature stabilized, you’ll see real energy savings. To see how a storm door can fit into your home, call us today at 804-275-5323 (Richmond,) or 757-464-2060 (Tidewater), for your free estimate.